The paperback and digital versions of Breathing the Fire, Fighting to Survive, and Get Back to the Fight, were released in the fall of 2011, with author’s proceeds and thousands of copies of the book going to the military-related charities listed below. I also invite you to visit the site set up by the friends and family of CBS Newsmen Paul Douglas and James Brolan, to raise money for The Rory Peck Trust to keep journalists safe in the field. And please visit the Captain Alex Funkhouser Memorial Endowment set up by the Funkhouser family to remember a great husband, dad and officer. Read more about him here. 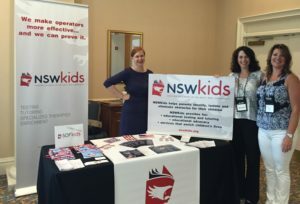 Dozier volunteers as a board member at SEALKids.org, formerly known as NSWKids.org, pictured here at a special operations outreach event with founder Suzanne Vogel and East Coast Family Advocate Lori Camper.